This is principally for VFR flight and also includes Customs/Immigration documentation and even lifejacket rental information. The material is subject to the disclaimer and release terms shown at the bottom of the page. Before getting into the Bahamas flight info, please note that if you're first coming from another state to Florida, that's the most challenging part of your trip. By comparison, the leg from Florida to The Bahamas is a breeze. So plan your within-U.S. flight carefully. Several days before departure study up-to-date sectionals. Get latest NOTAMs. Avoid Prohibited and Restricted Areas, as well as TFRs, MOAs and Class B. Plan your refueling stops conservatively (I like www.airnav.com to find best fuel prices). Just prior to departure check weather carefully. Filing a flight plan and using flight-following are highly recommended. For your whole trip (including the Bahamas section) remember to monitor 121.5. For the Florida-to-Bahamas leg, note that VFR flight at night is prohibited. Reading my Ditching: Avoid & Prepare page is recommended, but since you're flying a twin and your over-water hop is never outside 50 nm from land, you might choose to disregard some of the suggested preparations (but a lifejacket, although not required by U.S. regulations, is a must). The figure at right may help you visualize the procedures; Daytona Beach (not shown) is about 200 miles north of Ft. Pierce. All of the Bahamian airspace and airports covered here are in the Miami Sectional. Each flight must be on an active flight plan. For the return trip, you first call U.S. Customs to give them your arrival time. On return, you use a special squawk code (this is the critical item). That's it. It's that simple. The procedures below seem lengthy for two reasons. First, they include all of the procedures for the flight, including the common ones you use in domestic flights. Second, it's full of details, not just frequencies and backup frequencies, but how to file your return plan and call U.S. Customs for free from The Bahamas, even what to say to ATC. Before Flight. Do thorough flight planning, get a full briefing (including a check on whether Warning Area W-497B just off the coast is hot, in which case simply fly down the coast to the Stuart/Jupiter area before making the over-water hop) and file an international VFR flight plan direct to GHC (airport code MYBG, recommended altitude is 7,500 ft.). The international flight plan is essentially identical to a domestic one, except that it includes survival equipment (e.g., lifejackets). For weather and wind info at GHC (there's only one runway, 13/31) ask the briefer for conditions at Nassau (40 miles south) or click here to get hour-by-hour forecasts for GHC for the next 3 days; you may also call the airport at 242-367-8112 or 242-367-8566 just before departure. Then do a thorough pre-flight check, put sufficient fuel plus a healthy margin (no fuel at GHC) and check your lifejackets (you may rent them in Ft. Pierce, but regular $5 - 10 boat lifejackets also work). Flight Following. Highly recommended. Request it from Ground while taxiing, enter the squawk code Ground gives you, then activate it after you open the flight plan (next step). Open Flight Plan. Do it at about 1,000 ft altitude, after requesting a frequency change from the Tower. Before Entering Grand Bahama TCA. Your path will probably take you over Freeport and the Grand Bahama TCA. If you are flying below 6,000 feet and didn't get flight-following, you must contact Freeport Approach Control on 126.5. You'll get a squawk code and be flight-followed over the TCA. On Descent Self-announce on MYBG's Frequency. Because MYBG is uncontrolled, you do this on 122.8 at 20, 10, 5, and 3 miles out, transmitting your location/altitude/intentions and asking for traffic in the area. If you have Flight Following, do this with one radio while monitoring Miami Center on the other radio. Be advised that 122.8 is used by virtually all Bahamian airports, so there's lots of chatter, listen carefully for "Great Harbour" and be brief. Cancel Flight Plan. Do it in between above transmissions, when you have a clear view of GHC (even if MYBG is still not discernible) but above 3,000 feet if possible, by calling Nassau Radio on 128.0 (if you are unsuccessful, try Miami Radio's Bahamian tower at 118.4, or tell Bahamas Customs upon landing). 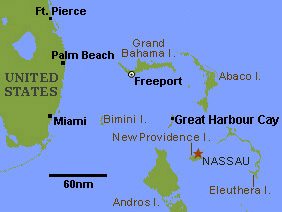 I like to ask Nassau Radio for wind conditions at Nassau, so I can plan whether to use runway 13 or 31 (4500 feet long). Landing. Straight into runway 13 is generally OK if traffic and wind conditions permit. Immigration and Customs. After landing, each U.S. citizen will need to show whatever is needed to re-enter the U.S. (an unexpired passport for U.S. citizens), each person will need to fill out a simple form, and the pilot will need to fill out a second form (get the form on line here and see how to fill it out here; you need 5 copies of the form, 3 for entry and 2 when you depart The Bahamas). Unlike Mexico, there is no requirement for aircraft insurance, and you will not be asked for aircraft registration, pilot's license, or radio operator's license -- just your passport. There is a landing fee of $7 per airplane but no tie-down fees. (Arrivals before 9AM or after 5PM or on weekends and holidays incur an Immigration overtime fee of around $50 per airplane). Before Flight. Do thorough flight planning (a toll-free, blue, direct-connect phone is provided at MYBG for a free call to Miami's FSS) and do a thorough pre-flight check, including visual confirmation of fuel quantity. Then the pilot fills out a simple Bahamian form called a Transire for the flight from MYBG to Freeport (MYGF). Prior to Take-Off and During Climb. Self-announce on 122.8, transmitting your location/altitude/intentions and asking for traffic in the area. Approaching Freeport. Follow proper procedures for controlled airspace, contacting Freeport Approach on 126.5 before entering the Grand Bahama TCA, which will give you a squawk, direct you into Freeport, and transfer you to the tower on 118.5. Before Flight. Do thorough flight planning. The same toll-free, blue, direct-connect phone is provided at MYGF for a free call to Miami FSS so you can get a full briefing, including a check on whether Warning Area W-497B northwest of Freeport is hot (if so, simply avoid it by flying west-northwest towards the Stuart/Jupiter area and then turning north towards Ft. Pierce). Do a thorough pre-flight check, including a visual check of fuel quantity; fill-up if needed. Then use the blue phone again to call the Customs office of your U.S. arrival airport (Ft. Pierce) so that you may file a Flight Arrival Report. The blue phone is even pre-programmed with the phone numbers of all Florida port-of-entry airports. Give the Customs officer your aircraft's tail number and arrival time, and he'll ask a) number of people, b) citizenship, and c) whether it's a private or charter flight. You don't file your flight plan by phone when you get your briefing from Miami's FSS; instead you file a written international file plan at the airport and pay a nominal charge. Finally, the pilot will fill out a Bahamian Customs form similar to the one he/she filled out on arrival at GHC (see sample) and each person pays a $15 departure fee. The procedure out of Freeport is like that of a typical Class C U.S. airport, with Clearance Delivery assigning you a departure squawk. Climb Out of Freeport. Climbing out of the Freeport controlled airspace, the tower will switch you over to Departure and you will then request a temporary frequency change to open the flight plan, calling Freeport Radio on 122.3 and then returning to Freeport Departure on 126.5. Getting Your U.S. Customs Squawk Code. After you're out of the Freeport TCA and Departure has terminated radar services and told you to squawk 1200, but before entering the U.S. ADIZ, call Miami Radio on 126.9 and request your U.S. Customs squawk code. Enter this critical squawk code (which grants you entry into U.S. airspace) in your transponder and check that the transponder is ON and working by looking for the light flashes. You must be squawking the assigned code before crossing the outer ADIZ line. Do not cross this ADIZ line without it! Generally, Freeport Departure will terminate radar services early enough to allow you to get the Customs squawk code before entering the ADIZ, but if there is a delay, you may have to keep climbing in a roughly north or south direction outside the ADIZ for a few minutes to get the termination from Freeport Departure, and then get the U.S. squawk code before entering the ADIZ. Monitor Miami Radio and 121.5. If you choose not to get Flight Following (next step), stay monitoring Miami Radio on 126.9. Also monitor 121.5. See important footnote below. Flight Following. After you're squawking the Customs code, if you had flight-following on the outbound leg and want it now to approach the U.S., call the Miami Center frequency which handed you off to Freeport Approach Control on the outbound leg and request it like this: "We're currently squawking wxyz for Customs identification and would like flight-following to ...". If they can handle you, they'll assign you a new code. Approaching Airport. Follow proper procedures, making sure that you call Approach Control for Class B or Class C, or the tower for Class D.
Cancel Flight Plan. Do it by contacting local FSS when you are in sight of the airport (ask permission of the Approach Control or tower to change frequency for a couple of minutes). If you can't do it in flight, ask Ground Control if they will do it or call 1-800-WX-BRIEF promptly after landing. Immigration and Customs. After landing at your selected airport of entry, each U.S. citizen will need to show a valid U.S. passport, each head of family will fill out a simple Customs form, and the pilot must fill out a U.S. Customs Form 178 and show pilot's license and medical certificate. Form 178 should be filled out prior to arrival; SOAPA organizers plan to provide them, but you may get it online here. The aircraft must also have a U.S. Customs annual user fee decal, which costs $25. You may apply for it online here. However, if you don't get it before the trip, you may pay the user fee at the airport Customs office upon arrival. If your transponder fails, it's critical that you be monitoring these two frequencies. Unauthorized aircraft or those with inoperable transponders are called on 121.5 and/or Miami Radio frequencies by location/direction/speed ("aircraft at 25.4 lat, 78.8 long, on a course of 92 deg, at 145 knots, contact ATC on xyz frequency"). Usually, even with a bad transponder, they'll let you into U.S. airspace if you report in, your aircraft was assigned an entry squawk code, you do some maneuvers directed by ATC so they locate you on radar, and you stay under active ATC control. DISCLAIMER AND RELEASE: The author believes that the information presented here is generally accurate, but it is provided without any warranty. The information is presented for reference only, should not be relied upon, and should be used only to augment other information obtained from official/reliable/credible sources. If some of this information conflicts with that obtained from other sources, ignore this information. Finally, you use this information solely at your risk and, by using it, you agree to release the author from any liability.